Sea Pines CSA recently announced the launch of a new program aimed at enhancing and preserving specimen Live Oaks inside Sea Pines. The Sea Pines Legacy Oak program includes 20 trees in total (14 individual trees and one grove with six trees), each named for it significance or location. The purpose of the program is to celebrate, interpret and enhance these trees, individually and collectively so those who live in and visit Sea Pines will have a better appreciation and understanding of Live Oaks and their need for protection. A Legacy Oak is defined as one in good condition, having limbs that project out in a uniform and radial fashion from a vertical trunk, is in a good setting, is picturesque and exhibits extraordinary shape. Unlike other trees, the branch spread exceeds the height. They are 45 to 90 feet high, with trunks from 28 to 80 inches in diameter and range in age from 100 to 320 years old. The Live Oak grove in Six Oaks Park represents the oldest group of trees, dating back to the late 1600’s. These trees once marked the entrance to the Lawton Plantation Mansion that existed between 1820 and 1870. Since the grove predates the Lawton Plantation, who planted them and why, remains a mystery. Harbour Town is best known for its lighthouse and its’ Liberty Oak; a 300 year old Live Oak under which Sea Pine’s founder Charles Fraser is buried. 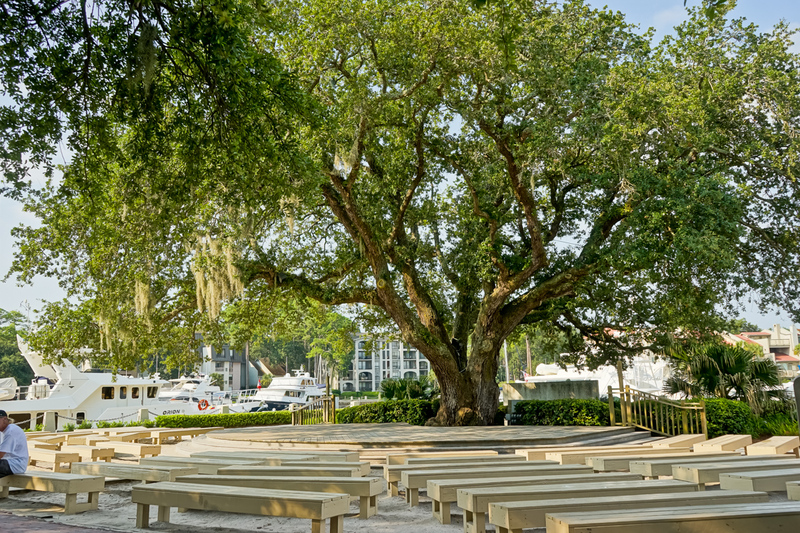 The Liberty Oak’s canopy shades a stage where legendary performer Gregg Russell has entertained hundreds of visitors in Sea Pines for over three decades. Visitors who wish to tour the trees, can do so by walking or biking along the leisure trails in Sea Pines. The complete tour takes 3 ½ hours by bike. The location of most trees are marked by wood benches or swings, offering visitors a chance to rest and take in the beauty. For a copy of the Legacy Oaks walking map and brochure, visit the CSA office at 175 Greenwood Drive, Hilton Head Island in Sea Pines or stop by one of the informational kiosks along the leisure trails. 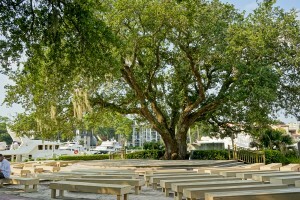 To download the brochure and map with GPS coordinates of each tree, visit www.seapineslegacyoaks.org.